Aside from sitting down with OculusVR founder Palmer Luckey and VP Product Nate Mitchell to talk about the latest (and upcoming) version of the Oculus Rift, we also got a chance to take the DK2 version of the headset for a test drive in several games. Here are some quick impressions for each of the four games. Lucky’s Tale was quick to answer our question in terms of how reliant VR technology is on first person perspectives. This game is a platformer not unlike Mario’s 3D adventures in terms of visual style and camera work. This time though, you don’t just control the camera – you ARE the camera. The ability to freely look around isn’t just a gimmick, it also works in a functional way. At one point in the demo, the goal was to launch projectiles at targets in order to progress further. This wasn’t just done with a ‘throw’ button – the angle in which you were looking also determined the trajectory of the bomb. 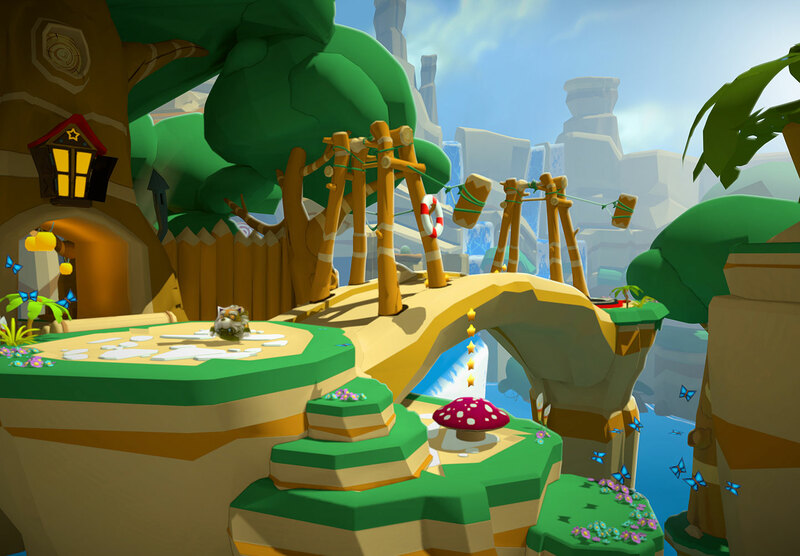 Also – swinging hammers of death that go back and forth across a bridge are way scarier when you see them approach in a virtual reality environment 😉 Still, at the end of the day Lucky’s Tale is really just a normal platformer, with the addition of Oculus support. The ability to look around is not too different from what the right thumbstick normally does, though the level of depth and immersion is far greater here. A lot has already been said and written about Superhot, a first person shooter that appears to be designed with virtual reality technology in mind. Using a relatively simple visual design, the demo saw us navigate three different (but similar) levels of increasing difficulty, but all with the same goal. Take down your opponents using the game’s bullet time mechanic. This is best and easily explained by just saying “when you stop, time stops”. Stop walking and the bullets that are flying towards you also stop moving. Thanks to VR technology and motion tracking, you can lean left of right while time is stopped, and get out of the way of oncoming bullets. Move or start shooting, and time will resume. It creates a great cat and mouse dynamic, where roles seem to switch every time the bullet time is used. Physically leaning left and right, looking over your shoulding to see bullets fly past you in slow motion – it’s the type of stuff that only really works convincingly in a virtual reality environment. 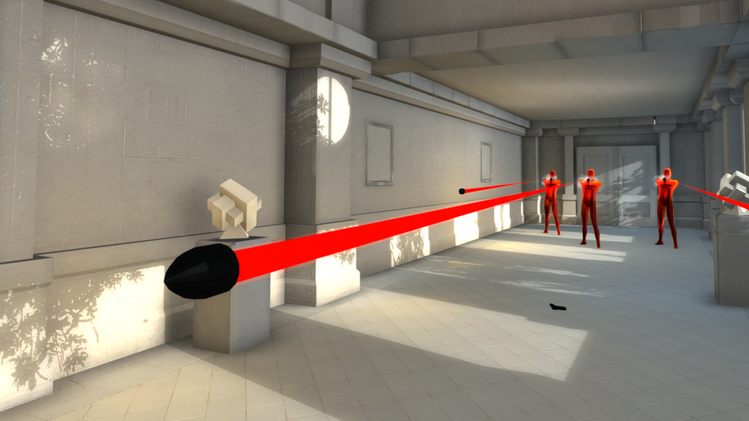 Superhot is therefore one title we’ll definitely be on the lookout for when the Oculus Rift becomes available. War Thunder’s been available for a while, but its developers recently added Oculus Rift support to the game. For those not familiar with the game, War Thunder is an online multiplayer combat game that has been in an open beta state for about two years now. Though the game will eventually feature (Battlefield 1942-esque) environments with aircrafts, ground vehicles and ships, right now its main focus is on aerial warfare. War Thunder was actually the first PS4 game we ever touched as well, back in the summer of 2012, so it has always had that “next gen” flavor for us even though it’s not groundbreaking in terms of visuals. Adding VR support does fit with this push towards “next gen” that we saw two years ago, and the technology lends itself extremely well to aerial dogfights. Looking over your shoulder as enemies fly by, only to re-acquire them in your scope, is a great experience. The same can be said for ascending to high altitudes and then leaning over to see what targets might be below you as you get in position to take them out with a dive run. 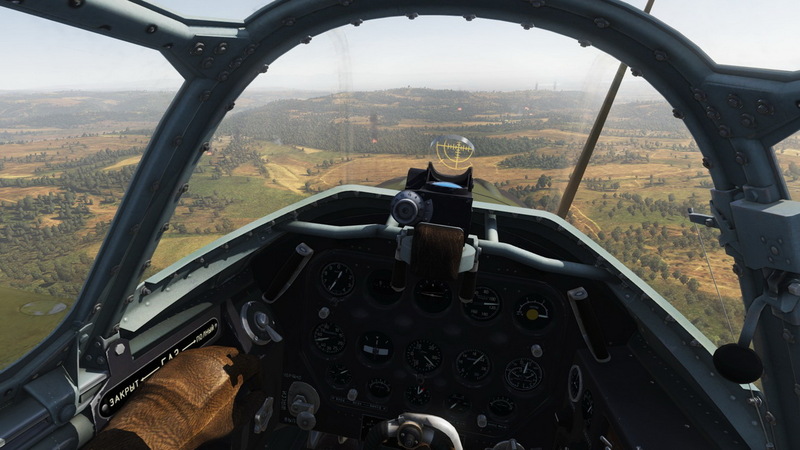 Our play session with War Thunder on Oculus was short, but impressive. Another game that is currently in beta is Elite: Dangerous, moving the Elite franchise into the virtual reality dimension over 30 years after its initial release made history. We’ll discuss Elite: Dangerous in way more detail in an upcoming preview, but what we got to play proved to us that our dreams of being a starfighter pilot are actually one step closer now that virtual reality headsets are being incorporated in the space epic genre. Having played a decent selection of games using the Oculus Rift, we are definitely convinced of how cool the VR experience can be. Even when the core gameplay stays more or less the same, the level of immersion is so greatly enhanced that it feels almost unfair to compare the VR version to the traditional ‘screen-based’ version. However, Palmer Luckey is right when he says that the team at OculusVR still has some hurdles to tackle. Because your eyes are so close to the display, the image isn’t as clear as you’d expect from a (full) HD display – you can compare this to watching a blu-ray movie at home and then pressing your nose against the screen – you’ll still see some pixelation and it’s no different with the Oculus Rift. Increasing that resolution will push the hardware even more, which shows us the emphasis on maintaining and improving a decent frame rate. What we also found was that even during relatively short settings, the padding on the headset could make you sweaty and uncomfortable. The headset itself is light enough for that not to be an issue, but we haven’t tested that during longer play sessions. Lastly though – ‘content is king’. For the consumer version to succeed, the headset needs the support of a least a few (upcoming) AAA titles. Without that, it risks facing a scenario not unlike that of a game console without any games that make it worth buying, no matter how good the hardware.